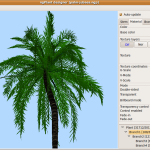 ngPlant is a plant modeling software suite. Designers can use interactive tool to create 3D models of different plants and trees. Software developers can use 3D API-independent library to use generated plant models in their 3D applications, or to create plant modeling plugins for different 3D modeling tools. 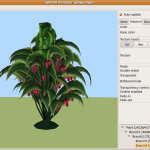 ngPlant is a Free Software project. 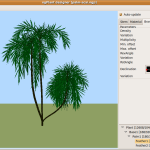 ngPlant modeling tool and ngpshot utility are distributed under the terms of the GNU General Public License (GPL). Software libraries (libngpcore, libngput and pywrapper) which may be used in another projects are distributed under the terms of the BSD License. If you have found a bug or have some questions or suggestions, you can e-mail me to serge(at)ngplant.org.